Image of the Truncated reflector. Truncated versions of the parabolic reflector may be termed 'shaped-beam parabolic antennas' and have the advantage that they may be designed for specific (and different) E and H beamwidths. This is useful in systems such as mechanically scanned search radars, airport surveillance radars, air traffic control radars and military height finder radars - where fan beam radiation patterns are required. 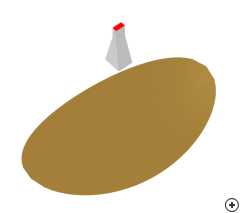 In order to realise a fan beam, the reflector is truncated (either cut-off horizontally, or using an elliptical intersection) and fed by an on-axis sectoral horn antenna. 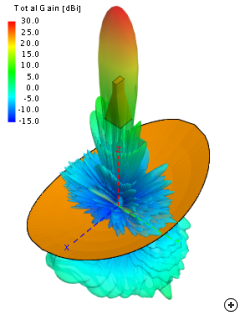 The antenna is usually focused experimentally by finding the optimal axial position (and transverse position if there are alignment errors) which minimizes the null between the main lobe and first side lobe. This is required, as the reflector's focus is not located at a singular geometrical point, but shifts with frequency. Antenna Magus offers various design options for this antenna: beamwidth (both E and H plane), peak gain, or gain with height restriction may be chosen. The following two images compare three different H-plane 3dB beamwidth designs (2°, 3.5° and 5° respectively) with a constant E-plane beamwidth of 6°, while the third image shows the typical 3D radiation pattern of the antenna designed for a peak gain of 30 dBi. 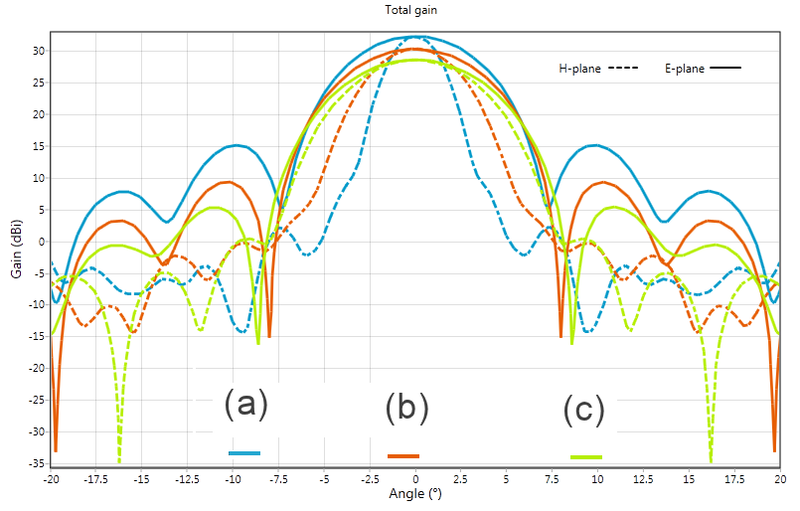 Comparing three 3 dB H-plane beamwidth designs: (a) 2°, (b) 3.5° and (c) 5°. 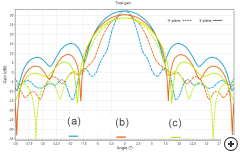 Zoomed pattern cuts for three 3 dB H-plane beamwidth designs: (a) 2°, (b) 3.5° and (c) 5°.